Jolie robe jaune aux doux reflets verts. Le nez est frais et aromatique avec des notes gourmandes de fruits exotiques (ananas, fleur d’acacia, litchi) et de pêche, relevées par de discrètes notes d’élevage et d'épices douces. Parfaitement équilibré entre richesse et tension minérale, ce vin offre une très belle longueur en bouche avec une finale saline à la belle amertume. The medium to full-bodied 2017 Condrieu Maison les Alexandrins is a worthy follow-up to the fine 2016. It shows hints of buttered pineapple in addition to the apricot aromas and flavors, then adds hints of peppery spice and a slightly chalky texture on the lingering finish. 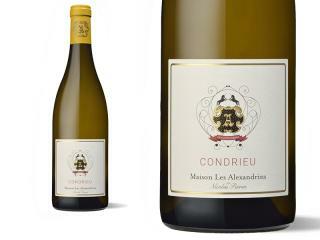 The 2017 Condrieu has some toasty notes and a modern slant, yet still offers very pretty stone fruits, apricot, spice, and floral aromas and flavors. It’s ripe, round, and supple on the palate, with moderate acidity, and is geared toward near-term drinking. The winemaking team put the brakes on the rich fruity side of Viognier here, going for more sculpted and fine citrus zest, saffron and apricot pit characteristics. It has a tight frame and a sense of slate physicality in the mouth from those granite soils. It’s aged half in barrel, half in vat for eight months, with no new oak. This vintage saw an extremely dry July and August, with just one day of rain over the whole two months, saved by a burst of 40mm falling in one day just before harvest. This will be bottled in September, and should age extremely well over the next five years. The grapes for Maison Les Alexandrins are grown on Côteau de Chéry – where Chapoutier makes a single vineyard bottling – and Côteau de Rozay on the higher slopes of the appellation.